Mechanical pencils can be used for a variety of purposes, including writing, sketching and drafting. In this article, we’ve compared the best brands of mechanical pencils in two different categories – professional and student grade – to help you decide which one fits your needs. Below, you’ll find that each brand is listed with a set of pros and cons and a brief description, based on our interpretation and summary of thousands of online consumer reviews and feedback from the WonderStreet community. We do not have a relationship with any of the brands listed below. Our own recommendations, presented in the “Final Thoughts” section at the end of this article, are based entirely on user feedback. We have included all of the most popular models and closely examine the mechanisms and features that set each one apart. We frequently refer to the “lead” of the pencil, however, this does not refer to the toxic chemical element, but rather to the mixture of graphite and clay used inside the pencil. These leads come in a variety of different thicknesses and can be advanced through the pencil using several possible mechanisms. The most common lead sizes are 0.3, 0.5 and 0.7mm. Common mechanisms to move the lead forward and out through the tip of the pencil include click advance (user clicks a button on the top or side of the pencil), twist advance (user twists the body of the pencil) and shake advance (user shakes the body of the pencil). Many of the world’s premium mechanical pencils have been designed and manufactured in Germany and Japan, two countries known for their dedication to high-quality engineering and attention to detail. The mechanical pencil first became popular in Japan in 1915, when it was introduced by Tokuji Hayakawa, a metal worker. He sold more than 12 million patented pencils in less than 10 years. Today, mechanical pencils are used by artists, engineers, architect, designers and students. They provide a more practical alternative to a standard wooden pencil because they do not need to be sharpened. Tell us about your favourite brand of mechanical pencil in the comments section at the bottom of this page. This pencil has a unique rotating mechanism that releases diamond-infused lead as the user pushes the point of the pencil down onto the paper. This ensures a smooth application and a continuously sharp point. However, it does not work well for those who have a very light hand. It is quite expensive, but it has a nice weight and does not often require replacement lead. A small eraser and lack of a grip were frequently mentioned negative points, but the overall quality of the pencil won over most reviewers. This pencil is designed for drafting and drawing, rather than writing. Many reviewers said that it is comfortable to hold and to use for longer periods of time because the barrel is nicely weighted with a low center of mass. It feels good in the hand, especially because of its soft grip. However, it is not the most durable mechanical pencil on the market. Some complained about the flimsy, poor-quality plastic material and an unlucky few reported that their pencils broke after being dropped onto the floor. Like the Uni-Ball Kuru Toga, this model also has a unique rotating mechanism that releases lead as the user pushes the point down onto the paper. Some reviewers pointed out that this is problematic for those who write in cursive or script because it is not necessary or natural to lift the pencil off of the paper when writing in these styles. It is also not recommended for those who write with a very light hand for similar reasons. That being said, the Kuru Toga Roulette Model is well-designed and routinely praised for its ability to stay sharp and maintain consistent lead thickness, even after hours of continuous use. Reviewers raved about the soft grip on the barrel of this Kuru Toga pencil. It is filled with a type of gel that is easy on the writer’s hand and provides some measure of relief, even after several hours of use. Potential buyers are warned that the tiny eraser that comes with the pencil is insufficient and wears out quickly. Like other Kuru Toga pencils, the lead does not retract, making it somewhat difficult to carry in a pocket. This pencil has been the preferred choice of many reviewers for decades. They like the durability of the P200 and say that it can withstand rough treatment. It also has a very modern and elegant design and balances well in the user’s hand. Like many other mechanical pencils, however, the tip does not retract and some reviewers complained of being stabbed in the leg with the lead when carrying the pencil in their pocket. According to hundreds of reviewers, this pencil has an excellent weight and balance. Its all-metal construction and the manufacturer’s attention to detail ensures that it is one of the best writing utensils currently available on the market. Many reviewers said that they have been using the Pentel Sharp Kerry for several decades. It is the only pencil to offer a protective cap, so it has the look of a fountain pen. A sturdy metal tip secures even the softest leads, making this an ideal choice for artists. The only aspect that is negatively reviewed is the pencil’s small eraser. However, this is a common issue for many mechanical pencils. A smaller barrel means that this pencil is significantly lighter than many other models. Despite its weight, the Pentel GraphGear 500 offers a sturdy metal construction and a solid grip of metallic mesh. Some reviewers complained that this metal, rather than rubber or plastic, grip often causes callouses after extended use, but others preferred the tighter hold that it affords. An extendable eraser is a welcome feature, but many were disappointed by the flimsy clip and decided just to remove it. The Pentel GraphGear 1000 differs from the Pentel GraphGear 500 in a few key ways. Both have a metal grip, but the GraphGear 1000 is heavier and has a retractable lead. This is useful if you often carry your pencil in your pocket and do not want to damage the pencil tip or your clothing. Non-retractable pencils often poke holes through trouser pockets. A rotating window on the barrel of the GraphGear 1000 allows you to see the type of lead that you have inside. All in all, it’s a high-quality pencil, but many reviewers noted that using the eraser could cause issues over time and that replacement erasers are difficult to find. They recommended using a separate block eraser. This pencil is perfect for writing notes or any other task that requires a quick hand. Unlike most models that have the lead advance button at the top of the pencil, the Pentel Quicker Clicker button is located on the side of the barrel. This means that the user does not have to stop writing and move his or her hand to advance the lead. A more continuous motion equals efficiency. Several reviewers noted that this pencil is difficult to find in stores, but it can be purchased online from a number of reputable retailers. A common complaint for a lot of mechanical pencils on the market is their disappointing erasers. Most have just a small nub of rubber that does not properly remove lead marks and wears down quickly. The Pentel Twist-Erase offers an eraser that works and that won’t be destroyed after one use. It is also sold with two replacement erasers. Reviewers of this product were thrilled that they no longer have to rely on a separate block eraser when writing with a mechanical pencil. It offers the same overall quality shared by all Pentel products. It writes well and the grip and weight are comfortable. The Pentel Orenz is a favourite among many artists. Thanks to a very thin lead with a pioneering anti-lead breaking mechanism, we found many rave reviews about the ability to write the tiniest symbols and characters with this pencil. It's perfect for artists, architects, mathematicians and more. It has a unique design that features a long metal tip, which protects the delicate lead inside and advances only the amount of lead that is really necessary for writing or drawing. Refills are a bit pricey, but the ingenious engineering of this pencil ensures that lead is never wasted. The balanced plastic construction feels lightweight, but not cheap in the user's hand. The Rotring 600 is one of the pricier pencils available, but many reviewers insist that the price is justified by the superior quality of the product. Many raved about the German manufacturer’s attention to detail, including the beautiful packaging. The barrel is black and made entirely from metal components. It is well-balanced and comfortable to hold, but it is not the most robust, compared to other models. Some reviewers said that the tip is easy to break and that the barrel can be quite easily crushed. Even more expensive than the Rotring 600, this pencil offers the same level of sophistication and quality. 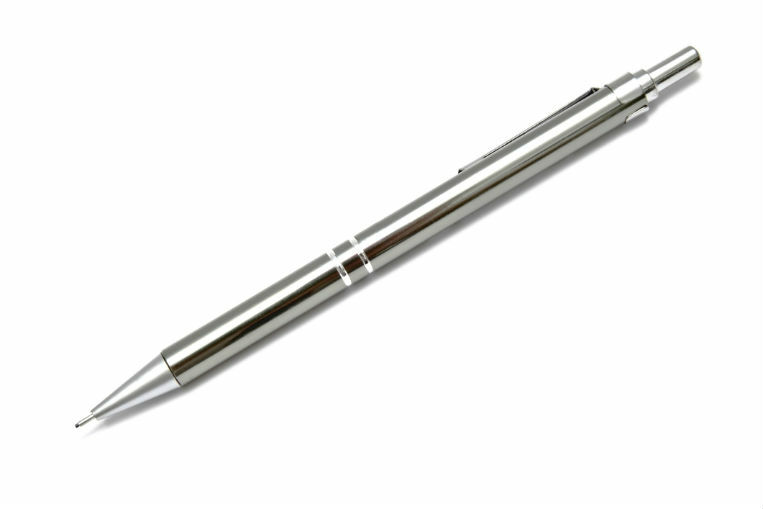 It also features a retractable tip, which might be appreciated if you frequently carry your pencils in your pocket. However, many reviewers preferred the 600 because of its unique lead indicator dial, which displays the thickness of lead that you are currently using. This extra is missing from the Rotring 800. There are also more reports of durability issues with this model, despite the higher price point. Unlike the metal mechanical pencils of Rotring, this plastic model is not built to last. Many reviewers complained about a variety of issues: jammed lead, broken lead, smashed barrels, etc. However, at a fraction of the price, it seems unfair to expect the same level of quality. Plenty of other reviewers were pleased with the even advancement of the lead and the overall comfort of the Rotring Tikky pencil. Because the weight of this pencil is more or less contained in the stainless steel grip, many reviewers said that it is nicely balanced and feels comfortable. The grip is knurled, meaning that there is a textured pattern rolled into the material by a lathe during the manufacturing process. This ensures a tight hold, even with sweaty hands. The biggest complaint about this model is that sometimes the metal tip will bend when the pencil is dropped, but most said that it can be easily fixed with a pair of pliers. Lamy is known for its line of fountain pens and several reviewers purchased the Lamy 2000 mechanical pencil to complete an office set. Though this model has some fans, it is not as popular as other brands and perhaps for good reason. Despite a high quality exterior design and construction, there were many reports of issues with the lead advance mechanism. According to reviewers, sometimes the lead would not advance and sometimes it would advance too far. Also, they said that the eraser is nearly useless. This pencil is on the lower end of the quality spectrum for mechanical pencils because of its plastic construction. However, this does make it significantly more lightweight, which is preferred by some professionals. It is a relatively durable model that can withstand repeated use and abuse. It comes in a variety of bright colours and it has a strong and flexible clip that can be fixed to a pocket or the cover of a soft or hardbound notebook. Though this pencil falls in the mid-range price category for mechanical pencils, many reviewers said that it was expensive, which leads us to believe that it does not offer a good value. Among the common complaints are the cheap eraser cap that does not fit tightly over the eraser and rattles against the barrel of the pencil, and an aluminum grip that tarnishes much faster than other models. The latter might be due, in part, to the very delicate knurling of the grip, which is appreciated by many reviewers. The thick metal construction is another admirable quality. This product is technically a “lead holder” and not a mechanical pencil. That’s because there are very few mechanical components behind its construction. Long strips of lead are stored inside the barrel and can be “advanced” with a button that completely opens the barrel. With a mechanical pencil, you normally click a button to allow the lead to come through incrementally. The length of the lead must be adjusted manually for a lead holder and if you are not careful, the entire lead will slide out of the holder. This writing utensil does not include an eraser, but it does have a built-in sharpener to maintain a fine lead point. The Pilot Dr. Grip Center of Gravity pencil offers one of the thickest barrels available on the market. This feature is perfect for older individuals and those who suffer from arthritis because it makes it easier to grip. It also has a very smooth and soft rubber grip around the barrel for additional support. The overall quality of the pencil is high and many reviewers agreed that the price is reasonable. Like almost every other mechanical pencil, this model has a very small eraser and some reviewers felt inconvenienced by the eraser cap. This pencil is the sibling of the larger Pilot G-2, which could be considered more of a student grade pencil. Professionals enjoy the use of the Pilot G-2 Mini because of its portability and retractable tip. It’s easy to throw it in a pocket or a purse and there’s no need to worry about the metal tip stabbing your leg or scratching your other personal belongings. The only cause for concern is the somewhat cheap plastic construction. Several reviewers said that it is not very durable and can be crushed if the user does not take some care to protect it. However, the price of these pencils is very reasonable, so they are quite easy to replace. In addition to the standard lead advance mechanism on the top of the barrel, lead in this pencil can also be advanced simply by shaking it. This feature is particularly useful for taking quick notes when time is limited and speed is required, because you don’t have to move your hand to the back of the pencil to click -- just a simple flick of the wrist will have the same effect. A wide barrel make this model more comfortable to hold and reviewers seem to appreciate the wide range of unique colours that are offered by the manufacturer. The retractable tip was seen as another positive. Aside from the usual small eraser, the biggest issue that most reviewers had with this pencil is its cheaper plastic construction. Many said that it is too lightweight and not very well balanced. This pencil comes with a unique fixture that prevents the lead from breaking while an individual is writing with it. A set of internal springs counterbalances the weight of the writer’s hand, putting less stress on the lead. In general, the pencil is very durable, despite having a plastic construction. Some reviewers complained that the pencil is too lightweight, but this also serves to keep the price reasonably low. Also, many were unimpressed by the less elegant exterior design of the Zebra DelGuard. This miniature metal pencil offers many of the same features as the Pilot G-2 Mini Mechanical Pencil. It is quite small and can easily fit in a pocket, purse or wallet. However, the tip does not retract (unlike the Pilot model), which is a frustrating oversight in a pencil that is meant to be portable. The narrow barrel might be difficult for individuals with larger hands to grasp, but it was a highly rated feature for many reviewers. Some said that the pencil is easy to misplace because of its smaller size. However, aside from the clip, it has a remarkably durable construction. This pencil is a favourite of many reviewers. It is made of high-quality stainless steel, with a plastic grip. The barrel is quite a bit narrower than other models, which can become tiresome for the hand over time. However, many noted that the weight and balance are very comfortable. Additionally, the price is quite low for a professional grade mechanical pencil and they are known for having a particularly long life. Like so many other mechanical pencils, a small eraser and a flimsy clip top the list of common complaints. The Zebra M-701 Mechanical Pencil was designed to complement a pen in the manufacturer’s collection with the exact same name. Many reviewers purchased it to complete a writing set and were pleased with the overall quality, namely, the reliability of the lead advance mechanism and the smooth way that the pencil writes. Most of the barrel is made of stainless steel, but there are some plastic components. The price is also on the lower end of the spectrum with regards to professional-grade mechanical pencils. Like the Pilot Delful Mechanical Pencil, this product also has the ability to advance the lead simply by shaking the barrel of the pencil. It does not offer a retractable tip, but it does feature a long twistable eraser, eliminating the need for a separate block eraser. Leads tend to break easily inside the barrel and several reviewers said that they do not like the cheap plastic-y feeling of this product. From one of the world’s most recognizable names in stationary, the Faber-Castell GRIP PLUS Mechanical Pencil offers a solid option for a good price. It is comfortable to use and has a smooth lead. It also addresses the most common complaint – an eraser that is too small – for almost every mechanical pencil on the market with a longer, twistable and replaceable eraser. The only problem with this brand is that it can be somewhat difficult to find in stores, but it can be purchased from a number of retailers online. This writing utensil, which is actually a lead holder and not a mechanical pencil, is recommended for carpenters and other sorts builders and labourers. It is thick and writes well on wood and metal surfaces. It also features a built-in sharpener inside the eraser cap. Several reviewers commented on the fact that the manufacturer used to make this product out of aluminum, but has since replaced metal with plastic. This, combined with the difficult-to-find and expensive leads has caused many loyal fans to seek alternative pencils. Because a pack of 10 BIC Pencil Medium Point Xtra Life costs less than most of the individually sold professional-grade pencils, it would not be fair to expect the same level of quality. They have a much thinner construction of hard plastic, however, they remain fairly resilient pencils that can withstand many years of use and abuse. The eraser, though small, works well and replacement leads and erasers can be bought in stores or online. Some reviewers noted issues with the leads breaking inside the barrel of the pencil, but this could just as well be a problem with the lead, easily remedied by purchasing a different brand of replacement lead. In contrast to the BIC Pencil Medium Point Xtra Life, this pencil has a very strong lead that is not at all prone to breaking because it is significantly thicker. Instead, it has issues with the lead falling out of the advance mechanism after repeated use. The pencils appeal to teachers because students no longer have to leave their desks to sharpen an old-fashioned wooden pencil. Also, the pencils can be purchased in bulk, which is ideal if you are on a budget. Students like these pencils because of the wide array of brightly coloured barrels. This is a good all-around pencil for students. The quality is fairly high, with only one reported defect. Occasionally the eraser becomes loose, which is annoying but does not render the pencil useless. A lead advance button on the side of the barrel ensures more rapid movement and faster note-taking abilities. The grip is comfortable and a twistable eraser is functional and easily replaceable, which is more than can be said for most of the more expensive brands of mechanical pencils. This brand of mechanical pencil could be considered “disposable,” because the pencils cannot be refilled. This is expensive and not the most environmentally-friendly option available. Also, the eraser is small and wears out quickly, so it may be necessary to have a supplemental block eraser. A twist advance mechanism applies a little bit of counter-pressure to ensure that you do not snap the point of your lead on the paper’s surface. In general, this product is thought to offer good value. The retractable tip on the Pilot G-2 pencil makes it much easier to carry around in a backpack or pocket because there’s no need to worry about it becoming snagged or tearing a hole through your clothing. Unlike the PaperMate Sharpwriter, this pencil is refillable. A removable eraser cap is unnecessary and will most likely be lost. This pencil has a fairly comfortable grip and is designed to complement the manufacturer’s line of ballpoint pens by the same name. Prices are reasonable: you can purchase several Pilot G-2 pencils for less than the cost of one professional-grade pencil. After reading through thousands of reviews and consulting with the artists of the WonderStreet community, we conclude with summarising our favourite products. For a pencil to take on the go, we recommend the Pilot G-2 Mini Mechanical Pencil because it is small, inexpensive and has a retractable tip. If a lead holder, rather than a mechanical pencil is more your style, the Staedtler Mars 780 Technical Lead Holder is a great option, because it includes a built-in sharpener and a strong metal grip. The Pentel Twist-Erase III Mechanical Pencil offers the most substantial eraser, while the Pentel Orenz and the Zebra DelGuard have unique lead advance mechanisms with a lot of positive reviews. From primary school to the university, the Paper Mate ClearPoint offers the best value for students because it is designed for taking notes with its side lead advance button and twistable eraser. Which mechanical pencil do you prefer? Tell us more about your experience in the comments section below.